PTOLEMUS Consulting Group has announced the winners and runners-up of its global ranking of mobility platform suppliers. PTOLEMUS Consulting Group has announced the winners of its global ranking of mobility platform suppliers. Mobility platform providers, also named “mobtechs”, offer cloud-based software solutions to mobility and transport operators. Mobility platform providers (MPPs), which aggregate multiple operators and modes on their platform. The headline winner for the TPP category is Germany-based INVERS. Other highly ranked TPPs include Ridecell and Vulog, two companies notable for their pioneering work in providing platforms for car and ride sharing companies. Australia-based SkedGo is the global winner in the MPP category. Moovit and Fluidtime were also ranked highly. The winning companies in this category offer a large variety of services and have integrated a large number of transport operators on their platform, which allows them to accumulate large transit datasets. The companies are among 17 vendors analysed and ranked in the Mobility Platform Suppliers handbook, the first in-depth global survey of cloud software vendors specialised in mobility. 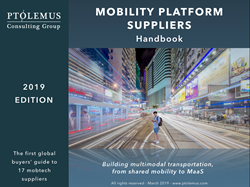 Alongside the supplier profiles, the handbook also details the ecosystem and value chain for the evolving Mobility-as-a-Service (MaaS) segment, as well as the 6 integration levels required to offer a complete MaaS solution. In the case of MPPs, the number of operators they have integrated into their solution. A more detailed description of the ranking methodology together with the full ranking results are available in the Mobility Platform Suppliers handbook. An abstract can be downloaded here. PTOLEMUS is the first strategy consulting & research firm entirely focused on connected & autonomous mobility and the Internet of Things. It assists leading technology players, automotive OEMs, insurers, mobility operators and public organisations in defining & deploying their strategies.